This software update provides compatibility with Samsung's next flagship smartphone, security updates and an improvement in charging performance. Improved battery charging with a better connection between the Gear S2 and the charging cradle. This software update brings newly refined and improved interactive experiences to your Gear S2. 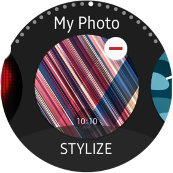 Use your own unique photos and graphics to customize your watch face with the My Photo app. There are new colors for basic watch faces too. 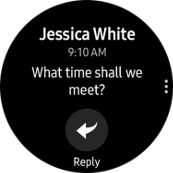 Reply to your text messages with ease, straight from your Gear S2. Enhanced Smart Reply now creates predictive responses based on the incoming message.